Lo, the pendulum swings. Things have happened so quickly in comics these last years that we are already seeing a backlash against the type of comics that broke the century-old mould and expanded the field of comics as expression and art, until recently almost universally embraced amongst ‘progressive’ comics cognoscenti. There is a new establishment in comics — graphic novels, artcomics, verité dessinée, call it what you want — and, as it should be, a conglomeration of people all set to tear it down, though not always for the same reason or with the same agenda, has emerged. At the same time, myriad new developments are taking the medium in new and different directions that elicit critical responses even before the ink is dry. This is only natural — the medium is in a state of evolutionary flux, and the battle of redefinition that these conflicting discourses are evincing is only to be expected. The latest flareup of this state of heightened tension in international comics culture was a kerfuffle this weekend and yesterday over a somewhat ill-advised piece by Heidi MacDonald on the high-profile, Chris Ware (co-)edited comics anthology The Best Comics 2007 from mainstream publisher Houghton Mifflin (follow-up here). Her post called a host of cheerleaders from out the woodwork, but also elicited vociferous criticism, making you simultaneously apprehend and anticipate the Fire Next Time. Lots has been said about the incoherence and contradictions in Heidi’s argument, and much of it justified, but the piece is nevertheless a valuable one in that it so obviously comes from the heart and voices concerns, skepticism and prejudice — however vaguely — common to a lot of comics amateurs as well as professionals these days. If it did not, it would not have been met with such heated reactions. Hers is not a cry in the wilderness — it is part of a pervasive trend within international comics discourse, which only seems to be growing stronger these days. From the articulation and debates around the concept of ‘Team Comics’ a few years back, over the steady drone against the perceived malaise of self-referential autobio comics, and increasingly embraced contrarian critical stances such as those of cartoonist Ted Rall and critic Noah Berlatsky (different as they are) against a new establishment of ‘literary’ comics, to more traditionalist backlashes such as Heidi’s, often operating under a somewhat reductionist take on the old content-over-form disposition, and clamouring for a return to solid, quality storytelling, comics discourse has entered a new age of self-reinvention. From ‘King Maus’ and the camarilla on the New York rooftop to the ardent defense of the fresh shoots in the soil of the medium’s Plates Bandes, it is clear that a certain way of thinking about comics has, by virtue of its potency, established itself at the centre of the New Comics’ état des choses. Art Spiegelman is obviously a key figure in this development, as are the founders of the seminal French label L’Association. They have been the ambassadors of the New Comics to the World at Large, and it is to a large extent to their credit that the ‘graphic novel’ has become something of a publishing phenomenon, the at times difficult consequences of which some creators and small publishers are now starting to feel, as the boundaries of the newly expanded field are slowly becoming apparent. Astonishing in this context is the oracular status Chris Ware has — thoroughly unwittingly, I’m sure — attained. What he says and does, goes. It is not for nothing that this latest hullabaloo was over an anthology edited by him. He is the walking rubber stamp of art comics, the embodiment of the progressive in comics, while at the same time the key figure of the new establishment and, of course, the only Master of American Comics of his generation. By virtue of his consistently compelling work as well as his strongly articulated personal taste and preferences, Ware has come to embody a dominant aesthetic ideology in non-genre comics publishing in America. The Year’s Best Comics 2006 looks and reads very much like his McSweeney’s #13 (in which he managed to make even the jocular and feisty Rodolphe Töpffer look bleak and suicidal), and could easily be mistaken for the similarly disposed Ivan Brunetti’s Yale-published Anthology of Graphic Fiction of last year. Needless to say, the aesthetic promulgated by these mainstream-oriented anthologies extends to the comics published by major publishers such as Pantheon and Houghton Mifflin, and has even come to be a guiding principle in the reinterpretation of the medium’s history actualised by large-scale reprints of the work of such masters as George Herriman, Frank King and Charles Schulz. Unsurprisingly, and of course necessarily, the critics are starting to show themselves, and their zeal is intense. Like those of Spiegelman, Ware’s accomplishments are as impressive as they are important, and like his older colleague, he is now probably becoming painfully aware of the mixed blessing it can be to deliver on great talent and to expound intelligently on one’s art form in a subculture still dominated by clannishness, while craving, at times sycophantically, a new canon. It is tempting to take up L’Association co-founder Jean-Christophe Menu’s problematic theory, formulated in his pamphlet Plates-Bandes (2005) and expanded upon by him and others in the journal L’Éprouvette (2006-2007), of this field of New Comics as a latter-day avant-garde movement. As in all such movements when they start attaining their initial goals, divisions are emerging and cracks showing, as it is being incorporated into the new mainstream it has brought about, and new directions are desperately sought for. This all seems to be perfectly natural growing pains for a medium that has for too long functioned within very strict socio-economical and artistic parametres and largely gone without a critical tradition. Just as the expansion of the field — its mainstream successes and well as its ‘dead ends’ (to quote one of Heidi’s less perceptive assessments) — was a development that had to happen, the newfound interest in, and discussion of, critical engagement with the medium, is part of a natural and very welcome maturation. So that is all well and good. The dangers as I see them are, however, endemic to this subcultural system of discourse and exchange. The microcosmic fan culture that has for so long informed and found nourishment in comics has seemingly proven fully adaptable to the otherwise radical changes of the last decade or so. The lack of critical tradition prompts thinking in totalities when talking about comics, assessing whether a given trend is ‘good’ or ‘bad for comics’, instead of engaging the work in a larger, healthier macrocosmic cultural context. Team Comics is alive and well, and because of comics’ still relatively isolated position in our culture, most of us are part of it whether we like it or not. But that does not mean we should not be aware of its discontents. Things are happening so fast at the moment that it makes little sense to let the patterns of the comics microcosm dictate our reaction to them. The both admired and maligned ‘comics literati’ mentioned are already being supplemented, though hardly replaced, by a small but very visible group of artists who are eschewing ‘literary’ as well as traditional storytelling tropes and conventions in favour of exploring comics as a visual medium. Hell, as Heidi’s post demonstrates, they are already becoming establishment within the microcosm. Kramers Ergot has become an institution. Chris Ware approves. And while we are fussing over developments within art comics, and the decadence of the old mainstream, most of us seem to be forgetting that the changes we have found radical this last decade will soon be dwarfed by the changes to comics and cartooning — and, surely, visual/narrative art in general — brought on by the formidable influx of East Asian comics and animation as well as the immersion in digital media that has become a fact of life for the younger generations. The comics microcosm has tended to regard this as some kind of cultural disturbance of the peace, often treating the former as if it were a ‘Yellow Peril’ to be contained, while blissfully ignoring the latter. We are at an extremely interesting point in the evolution of comics and cartooning, and by virtue of their specific history and traditions they clearly have a lot to offer the broader cultural field. Criticism of established bodies, practices and approaches is as always necessary, and often constructive, but should be made with the Bigger Picture in view. Who cares whether a given trend is ‘good for comics’? Is it good for me? Is it good art? Interesting as it is, the definition game only goes so far. Photo by Jeff Riedell for the New York Times, published April 11 2004. 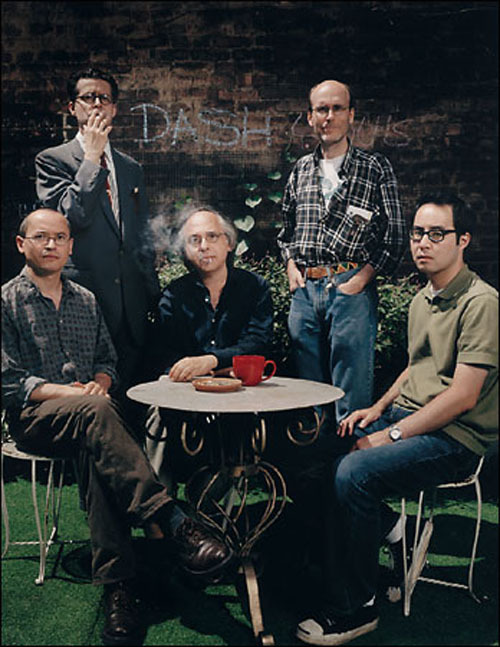 It shows (L-R) Joe Sacco, Seth, Art Spiegelman, Chester Brown and Adrian Tomine on Spiegelman’s rooftop in SoHo.